Investigate temperature, motion, force, magnetism, light, electricity, and pressure through the 43 experiments provided to support elementary science curriculum. 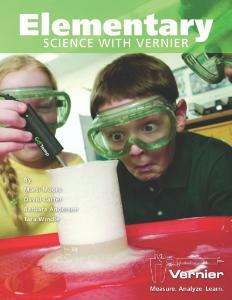 Each experiment is designed for use with Vernier probeware and includes complete student experiments with full instructions, a materials list, data tables, and questions, teacher information for each experiment, and word processing files of the student sections on a CD for easy print-out and editing. Complete these experiments with your computer or LabQuest.